All the same Bentley goodness, with a tad less power. When Bentley, it decided to put its best foot forward by using a new version of its 6.0-liter twin-turbo W12 producing 626 horsepower. The last generation Continental was also available with a 4.0-liter twin-turbo V8 and now Bentley has introduced a newer version of the very same engine in the new Conti. Available on both the coupe and convertible, the new V8 engine produces 542 hp and 568 lb-ft of torque going out to all four wheels through an eight-speed automatic transmission. 0-60 mph takes 3.9 seconds in the coupe (compared to 3.7 seconds with the W12) or 4.0 seconds if you opt for the convertible and top speed is a whopping 198 mph (compared to 207 mph with the W12). In the real world, the V8 car sacrifices very little performance while dropping weight and improving vehicle agility and responsiveness. Bentley says the V8 Continental GT is extremely efficient thanks to its ability to shut down four of its cylinders. The transition from running on eight cylinders to four takes just 20 milliseconds, making it imperceptible to the driver. Likewise, the stop-start system activates at "near-to-stop" speeds to help make it smoother. 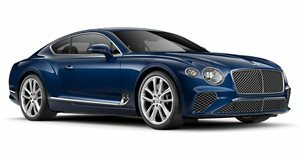 With these fuel-saving technologies in place, Bentley says the V8 Continental GT will cover 500 miles on a tank of gas. To differentiate the V8 from the W12, Bentley has given this new car 20-inch, 10-spoke painted alloy wheels as standard, though other designs are available up to 22 inches. The V8 Continental can also be picked out in a crowd by its quad exhaust pipes and V8 badging on the front wings. Inside, the V8 models still boast one of the best interiors in the automotive industry with premium, all-natural woods, and leathers. The optional Bentley Rotating Display makes a comeback, looking like it came straight out of a Bond film, and is connected to a standard 10-speaker, 650-watt Bentley Audio system. 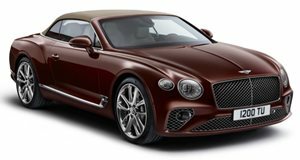 If you opt for the convertible, Bentley offers a range of eight roof lining colors on a roof that can be raised or lowered in just 19 seconds at speeds of up to 30 mph. Pricing hasn't been announced but the V8 Continental should be significantly less expensive than the W12 model, which starts at $219,925. Deliveries will begin in Q3 of 2019 if you live in the US, while other markets will have to wait until 2020.